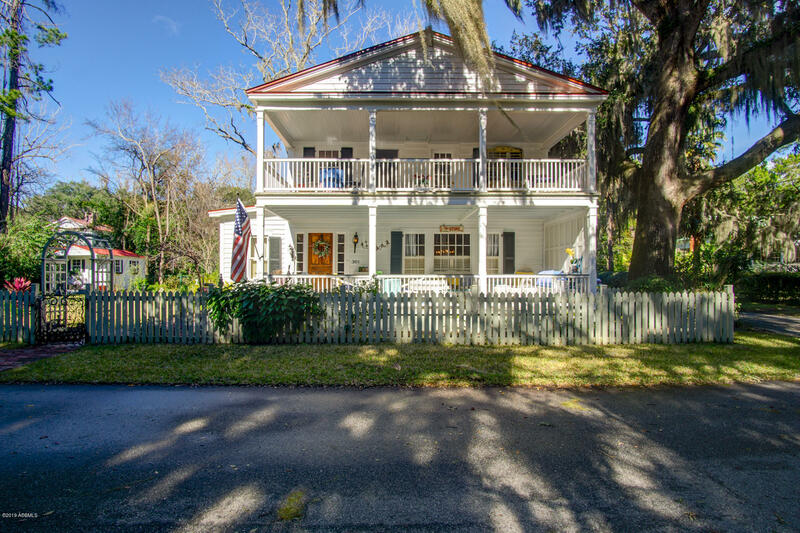 Historic District ''The Point'' 1825 home totally restored in 2012 and in 2015. Spacious double front porches overlooks ''The Green'' open area. A Gardener's Delight. Large landscaped fenced yard. Primary living spaces (Living Rm., Dining Rm., Kitchen, Master Bedroom & large modern Bath, walk-in closets, Family Room & Laundry Room 1/2 bath all on first floor, a few easy steps up from walk.2nd floor: 2 Guest Bedrooms (one could be a Study) full bath, access to large porch overlooking gardens, Village Green and century old Spanish Moss draped Live Oaks. 2 off street gravel parking spaces/drive . Property around the house planted with gardens and a large lawn, all irrigated.12' x 18' Garden Shed. 6 burner gas range, double oven, modern kitchen. Newer HVAC. Best deal on the ''Point''.